One way to guarantee yourself easy access to Good Food (most especially during your Whole30) is to pack your food and bring it with you. You can make awesome lunchtime fare from Paleo Power Lunch, but how do you get it to the office or job site? Here at Whole9, we’re most concerned with the quality of food you put in your body, but we’re also concerned about your overall health, and the health of our planet. Whether you’re bringing breakfast with you on your morning commute or packing a school lunch every day, we want you to have a safe and environmentally friendly container to put that Good Food in. That’s why we love LunchBots – the highest quality, best looking stainless steel containers on the planet. Whole9’s Robin Strathdee sat down with Jacqueline Linder, the outside-the-box thinker and founder of LunchBots, to chat about what makes LunchBots the right storage and travel fit for Good Food enthusiasts. W9: Your website makes three statements about lunch (which we can safely assume extends to the other meals, too). We love them and how they fit in with a real food lifestyle. Let’s talk about those. First, you say, “Lunch is healthy.” What does a healthy lunch look like to you, and how do LunchBots containers factor into a healthy lunch? JL: A healthy lunch to me is healthy food packed in healthy containers. I want to know what I’m eating, where it came from, and how it was prepared. The best way to do that is to prepare it myself and bring it with me. LunchBots containers allow me to pack just the right food, the right portion size, and the right variety and bring it with me – to work, on a hike, while traveling, etc. I started LunchBots because I was concerned about the chemicals from plastic leaching into my food and I needed lightweight, non-breakable containers for packing food to go. I searched worldwide for stainless steel containers with no success. This motivated me to start LunchBots four years ago. W9: Your second statement: “Lunch is waste-free.” Minimizing environmental impact is important to your company. LunchBots are, obviously, re-usable, but how else do your products reflect that consciousness? JL: To date, we have prevented millions of plastic sandwich and snack baggies from ending up in our landfills, which is significant. I’m thrilled that even as a small business we can make a noticeable difference! Reusable plastic containers are still very often tossed in the trash when they get warped or stained. Stainless steel is durable enough to last a lifetime. In addition, we encourage everyone to BYOC (Bring Your Own Container) for take out and restaurant leftovers. The amount of waste created from restaurant take out is staggering! It is easy to keep a few containers in your car along with your reusable grocery bags or toss a container in your purse when going out to eat. W9: Your third pronouncement: “Lunch is fun!” We agree! What is the most enjoyable part of building a LunchBots lunch? JL: I love creating new combinations every day when I pack lunches for everyone in my family. On the weekend, I shop, wash, chop, roast, grill, and sauté a collection of proteins and vegetables, and have fun mixing and matching healthy meals all week. I’ll even combine foods that may seem odd together (like curried cauliflower and BBQ chicken). 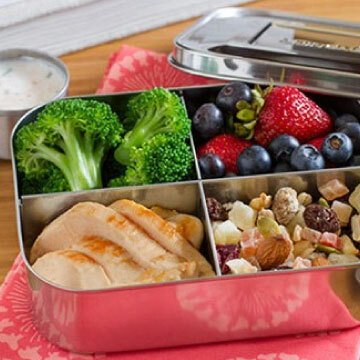 Containers that are perfectly sized really inspire enjoyable lunches because you pack the just right amount of food. Variety is the spice of life and our divided containers like our Duo and Trio keep things organized and make it easy visually see you’ve got a good balance of foods. It’s equally important for your lunch on the go to look appetizing. So much of our enjoyment of food is visual. Eating vegetables out of a plastic baggie…or opening a Trio and enjoying one section full of red pepper slices, another section of cucumber slices, and the third section filled with avocado. Big difference! We’re totally on board with healthy, waste-free, fun lunchtime fare, and we’re jazzed to team up with LunchBots to help you make all your meals on the go fit that bill. Jacqueline has created a special LunchBots page just for our readers, where you can find the nine most popular Lunchbots at a 15% discount with free shipping! Visit http://www.lunchbots.com/whole30.html to automatically score your discount. And today, we’re giving away one set of the Uno, Duo, and Trio LunchBot to a lucky Whole9 reader! To enter, you must be a fan of Whole9 and LunchBots on Facebook. In comments, give us five words that embody your ideal lunchtime. Contest closes Sunday, August 12th at 11:59 PM PST – we’ll pick a winner on Monday afternoon. Happy lunching! Whole9 has no financial affiliation with LunchBots. We just really dig their stuff, and like securing special discounts and contests for our readers. I like both! 5 words to describe lunch for me… nourishing, fresh, social, easy, and delicious! Sunshine, nourish, refresh, savor, yum! Wholesome. Peaceful. Centering. Recharging. Relaxed. Lunch is my calm spot in the day to focus on nourishing myself, amidst a schedule that generally focuses on working for others. LUNCH = easy, healthy, yummy, quiet & recharging! FYI, the h in http is not included in the link above so it does not work unless you cut and paste. Liked! Fuel, nourishment, Pre WOD, fun, and working on eating it “slow”. Hardest part of my Whole30 so far is teaching myself to eat slower. Hi everyone! The link is working again. Paleo leftovers in my Lunchbot! Paleo noms in my belly! Sun shining over simple salad. satisfying, energizing, convenient, frugal, and organized! Delicious, paleo, on the beach! Yummy, healthy, easy, quick, fun! Yummy, healthy, organic, grassfed, fresh. Portioned, healthy, tasty, satisfying! Really love these boxes! Filling, easy, nutritious, delicious, and satisfying. How hard is it to wash the divided box? It looks like it might be hard to get into the small corners. Phone stops ringing for once!!! Lunch is Replenishing, Refreshing, Calming, Smoothing, and relaxing. My ideal lunch is: healthy, homemade, delicious, colorful and satisfying! MMMMMMM!!! :) I’m getting hungry just writing about it! LOL! Thanks for the chance at these wonderful lunchbots! I liked both pages on FB. My ideal lunch is: nutritious, delicious, colorful, portable & satisfying. Easy, tasty, filling, quick-fix, inexpensive. My 5 words to describe an ideal lunch: fresh, healthy, delicious, fulfilling and whole 30 friendly! Nom nom paleo to go! I work in a lab and when I don’t get a nutrient dense meal around midday my motivation to do science decreases at an alarming rate. Noon, savory, rest, satisfying, easy! Ready to eat, thoughtful, mine! Jen, send me your mailing address and we’ll get those Lunchbots Uno, Duo, and Trio off to you ASAP! Happy lunchtime to all. I love the look of their containers, but I can’t nuke leftovers in stainless steel. :-( I could use these for my son, though, so I might at least look into them for him! Cool, fresh, fun, organic, healthy… Thanks for the chance to win! !